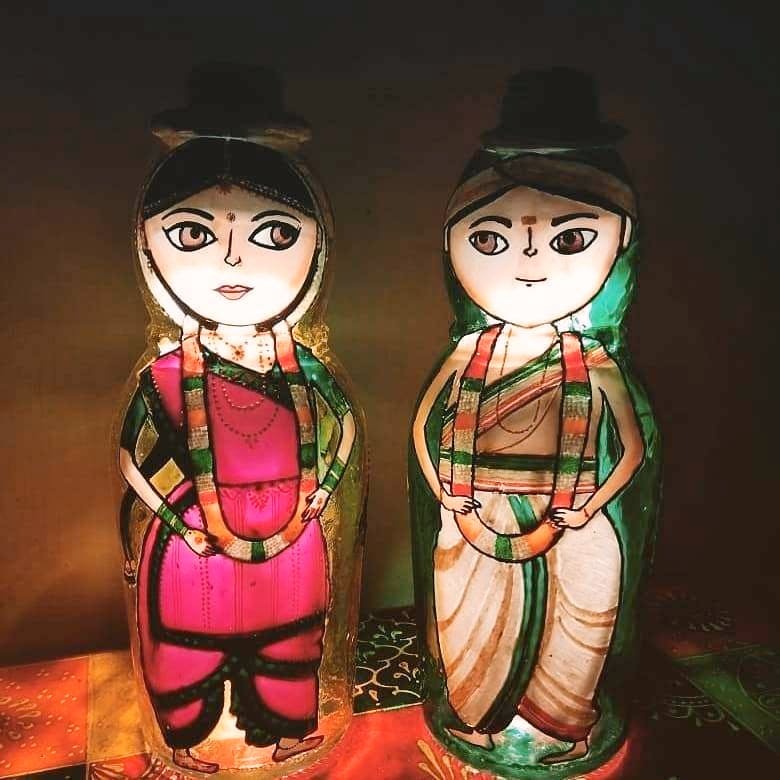 For the love of lights and home decor, Vidya Bhat (artist) and her husband Sushrutha KS (lighting expert) started Chittaara (six months ago), a brand that showcases art on glass bottles and lanterns. Artist met lighting expert and magic happened and these adorable lights are proof. It’s a task to find unique and one-of-a-kind lights and lanterns with everyone buying the same stuff online, and this same issue led to the duo experimenting with their first light. Vidya started by painting on Amul Kool bottles and once it lit up, she was unstoppable. The glass bottles are upcycled ones (including liquor bottles) and she uses glass paints. The couple has been collecting junk bottles in different shapes from shops and the art varies from abstract art to traditional Indian designs and quirky patterns. We like the ones with peacocks and auto rickshaws. The bottles are priced from INR 200. Apart from lights, they also make lanterns and seashell flower bouquets. These seashell bouquets are made using seashells they collect from the beach and are priced from INR 500. If you want any of their products, place an order a week in advance so they can curate the design it for you.